Free DeliveryKudos Ultimate 2 Straight Corner Walk-in Shower Pack From £639.80 inc.VATRRP: £914.00 (Save 30%)Multiple sizes, price includes shower tray. Pictured with optional deflector panel which is not included in the price. 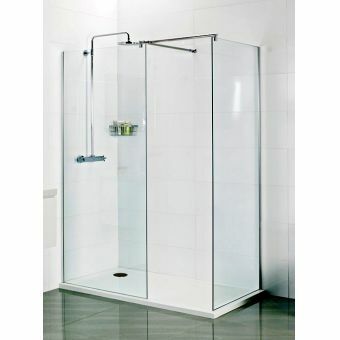 Free DeliveryMatki EauZone Plus Wet Room PanelFrom £423.00 inc.VATRRP: £564.00 (Save 25%)A staggering 22 panels sizes from 200, up to 1500mm in width, made from sturdy 10mm safety glass. Free DeliveryAbacus E Series Walk In Curved Shower Screen£441.00 inc.VATRRP: £630.00 (Save 30%)Curved screen, 1050mm wide 2000mm high, 8mm glass with durable 'Easi-Clean' glass coating. 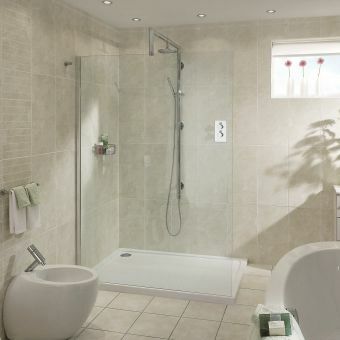 Sommer Wetroom PanelsFrom £223.33 inc.VATRRP: £279.17 (Save 20%)Optional side panels and hinged deflectors. 8 sizes from 700 to 1400mm wide. All 2 meters high. Free DeliveryMatki EauZone Plus Twin Entrance Wet Room Panel with Bracing BarsFrom £572.40 inc.VATRRP: £763.20 (Save 25%)A luxurious double walk-in panel, walk-in walk-out design for showering luxury. Bespoke colours available. Free DeliveryImpey Soho Black Double Walk in Wetroom PanelFrom £678.05 inc.VATRRP: £904.07 (Save 25%)Black shower, powder coated steel frame with black framed effect silk printed glass, 2 sizes: 1200 or 1400mm. 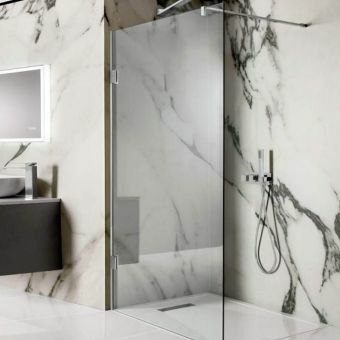 Easier to access, easier to clean and a lot easier on the eye - walk-in showers complement any contemporary bathroom and modern style of living. 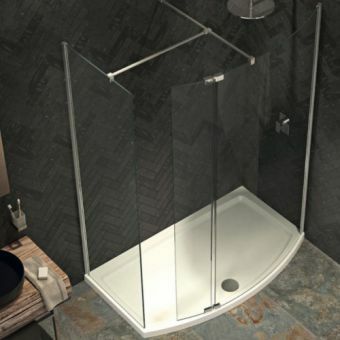 No more quick, uncomfortable showers in a small, box-like compartment. 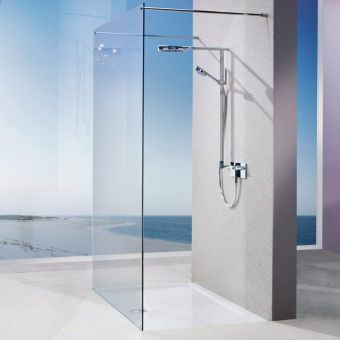 With UK Bathroom's walk-in showers, you have the room to truly feel the healing and relaxing qualities of a long, warm shower. 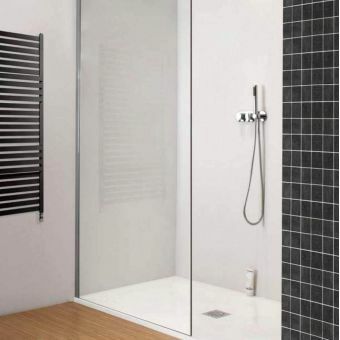 Currently, we sell nearly 100 walk-in showers by a range of different companies and in a variety of different shapes and sizes. 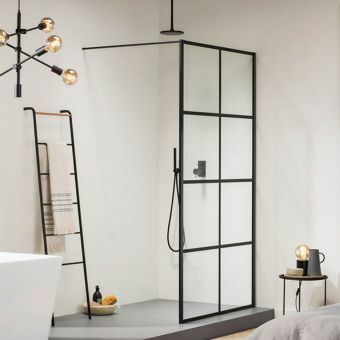 The modern shower has over time, undergone improvements that have seen it change from a simple device that sprayed water, whose temperature could vary and was normally situated over a bath. 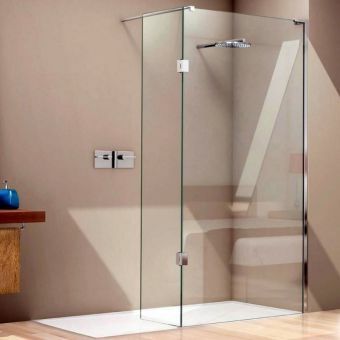 We are proud to offer you a wide selection of walk in showers. We have a number of different styles and designs which come in a range of sizes, allowing you to find something to fit the space you have. 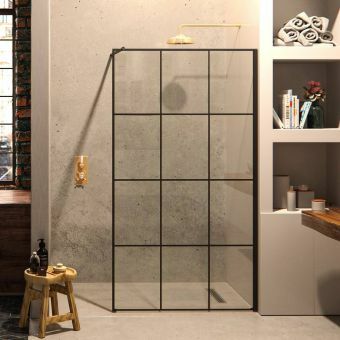 The modern walk-in shower today is very different, and just like a bracing walk, the morning shower is a great means of starting the day. 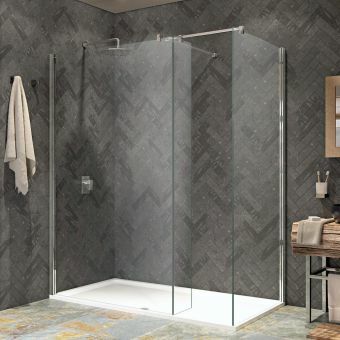 Walk-in showers are designed to be easily accessible for old and young alike, in fact, a walk-in shower lessens the possible risk of an elderly person slipping or getting into or out of the bath. 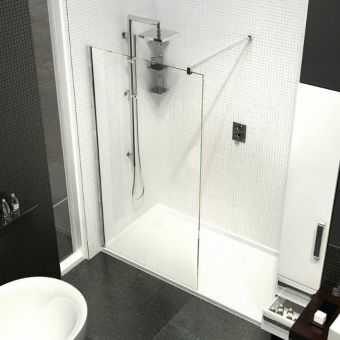 All our walk in showers are all designed to the legal safety requirements and are built for durability. 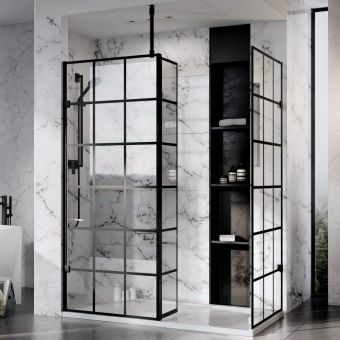 There are many advantages when you choose a walk-in shower, naturally, there is easy access, but a walk-in shower is usually easier to clean than a small enclosure, or a shower which is fitted over the bath. 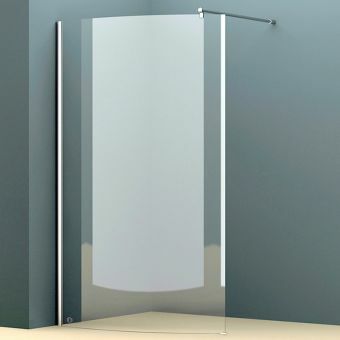 Many of the examples on our web pages have easy clean glass ensuring that the glass remains clear and sparkling clean, without cleaning each time the shower is used. 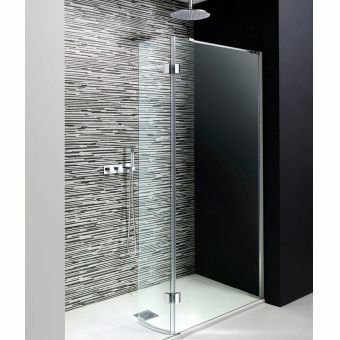 We currently have nearly 100 examples of walk-in showers, in a variety of sizes, with both straight and curved panels. 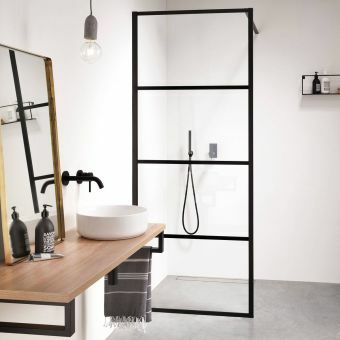 You have also a wide choice of trays, or the walk-in shower can be designed to have no tray, just a ceramic tiled floor with drainage. What are walk in showers? Traditionally popular in Europe Walk Ins are the fastest growing design trend we have seen. 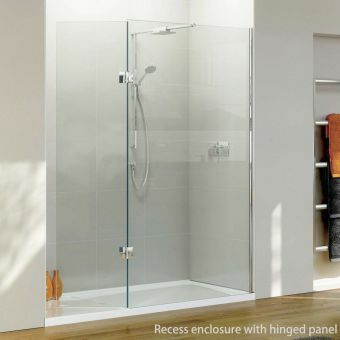 A Walk In shower is different to your normal shower enclosure. 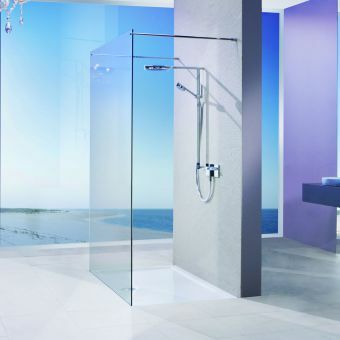 A normal shower enclosure will have some sort of door, be that hinged, pivot or slider. This is mainly because here in the UK we are very conscious of leaks and damaging our bathrooms. The way we build our bathrooms is very different to on the continent, we will mount our trays on timber structures and joists. In countries like Germany, they have their trays directly on concrete, so they are less conscious about leaks. 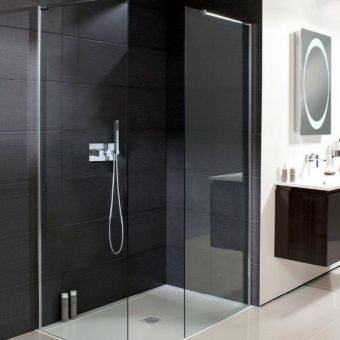 Walk In showers work on the same principle as a wet room, there is no traditional enclosure or door for you to pass through. 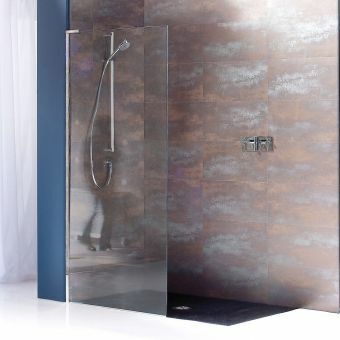 The only real difference between a wetroom and a walk in is the shower tray. 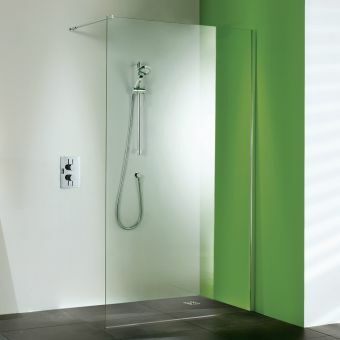 A lot of our walk in and wet room panels can be used in either a wet room or walk in shower. 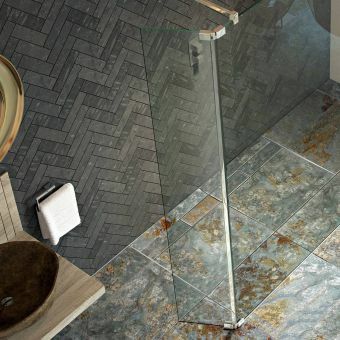 It’s a little perplexing sometimes as other retailers and manufacturers will blur the lines and confuse the terms; mainly because most of the glass panels can be used with both. 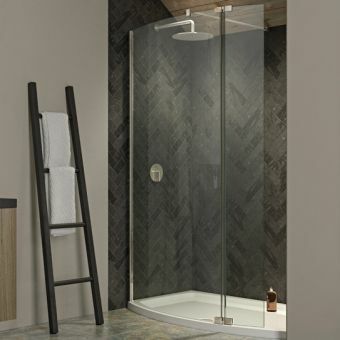 So if you see something in our wetroom section and you like the look of it and wonder if it is available as a Walk in shower, just give us a call or drop us an email and we will confirm it for you. What is a standard walk in shower size? 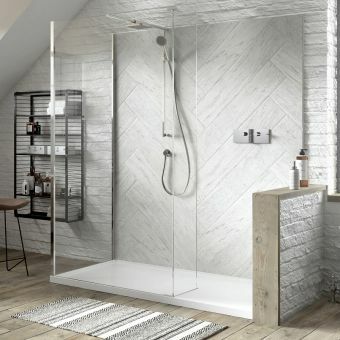 One of the biggest trends we have seen in recent years is customers are ripping out their cumbersome impractical baths in favour of a Walk In Shower. Whilst there is no such thing as a “standard” size, if you are replacing your bath most baths are 1700 x 760. There isn’t really any restrictions on the size you can have with a Walk In. They generally work better in larger spaces, but that is more of a rule of thumb opposed to a restriction. 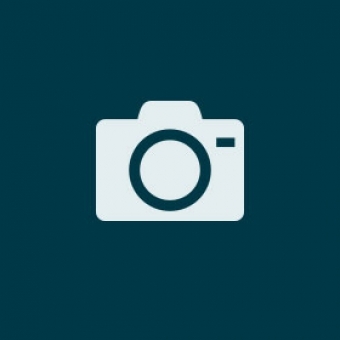 There are also multiple types of configurations you can install. Most common installations are what we call recessed, where you are installing the walk in between 3 walls and the other configuration is corner. Is your bath looking a bit tired? Do you prefer a shower to a bath? Is the bath being hardly used? Are you a bath or a shower person? Bath people look away now. 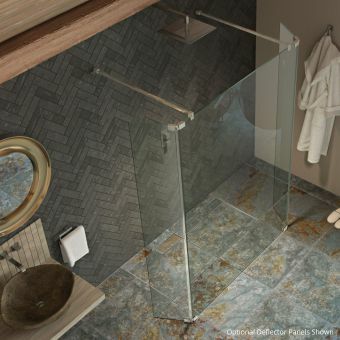 Walk In showers are easier to clean, especially when they have easy clean coatings! Are showers more efficient than baths? This very much comes down to how long you spend in the shower. If you are in there half a day then it’s not going to be very environmental. However, if you are having a typical 10-minute shower then would be using around 20 gallons of water whereas if you are using an average bath then it will take around 36 gallons to fill it. Being water efficient is not only good for the environment it’s also good for your bank account. It’s a no-brainer, the more water you use the more it will cost you. So using more water efficient means like a Walk In shower will overall cost you less. You can go a step further with this and look at showers and shower heads with water saving technology in them. 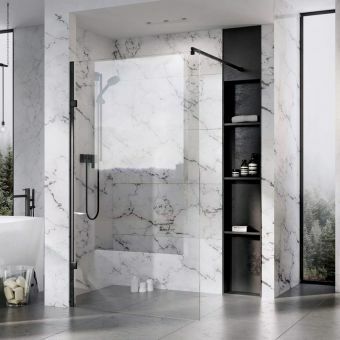 We would recommend looking at partnering up any Walk In Shower with the German manufacturer Hansgrohe, as they specialise in water efficient products. Hansgrohe has a range of products call EcoSmart which over a period of time are better for the environment and will save you money. 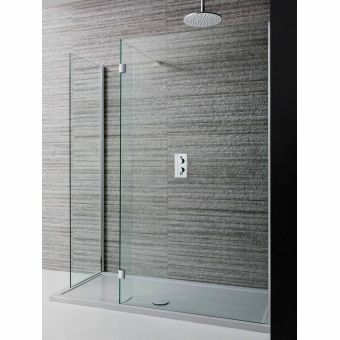 Where to buy walk In shower? Some say that the only way to buy a bathroom is to see it in the flesh, as you have no idea what the quality is going to be like. We disagree with that totally, we are here to make sure you don’t need to waste hours of your life (which you don’t get back by the way!) trawling round a showroom whilst sales advisors stare at you and stalk you round their showroom like a pack of hungry hyenas who have just found lunch. 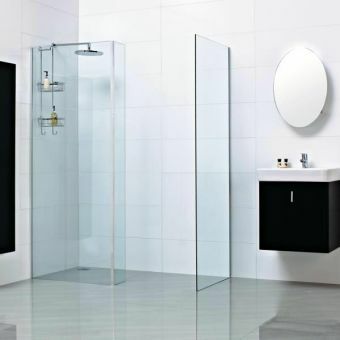 All the Brands and Manufacturers found on ukbathrooms.com have been handpicked and have to pass the most rigours and toughest industry standard test in the UK; would we have this in our own homes ('n wea'ar eur fussy lot fra Yorksha, sa if it dunt last 'n it dunt fettle then we don’t want it)? You can be certain of the quality of the feel of any Walk In Enclosure. Which means all you need to do is match it to the style and look you are trying to achieve for your entire bathroom (we can help with that if you get stuck) which you could do from the comfort of your own sofa and we recommend with a nice cup of Yorkshire Tea. What does a walk in shower cost? We specialise in branded bathrooms. These are manufacturers that put their name to their product and are proud to stand by it. Each brand will have its own ethos and pedigree. There are plenty of people in the industry who sell unbranded bathroom products, where you do not know where it was manufactured and to what standard it was manufactured. Saying that not all brands were created equally and we sell an array of different manufacturers and brands. If you are looking for an entry-level product then we would recommend looking at Sommer which starts from £203 inc VAT. 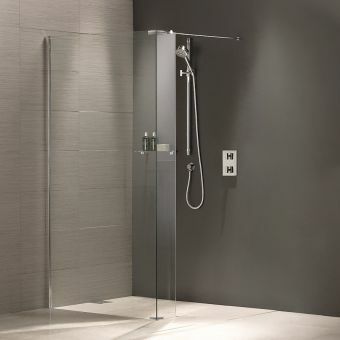 If you are looking for a mid-range product then we would recommend looking at Simpsons, Kudos and Roman Showers. If you are looking for the best of the best then without a doubt you need to be looking at AQATA and Matki. Matki probably being the most recognisable name in shower enclosure, and there is a good reason for that! Generally, you will find walk in screens are available in a 6mm, 8mm and 10mm thickness option. The 6mm glass will come in at a lower price than the 10mm glass. Regardless of the size all the enclosures and screens we sell are made with safety glass. 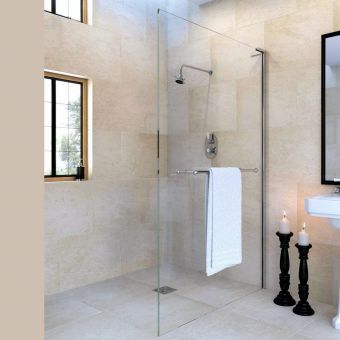 We have touched on this above but there are many different ways to configure a Walk In shower. The reason there are so many options is that everyone’s home is different and everyone’s style is different. We ensure we have got as many options and permutations as possible to ensure you can find exactly what you are looking for. From a single fixed panels to multiple panels with a hinged deflector panel. If you are not sure what you need, why not take a look at our Kudos Ultimate 2 Walk In Packs which can guide you through what you need. How to clean walk in showers? As Walk In are easier to clean than baths this is nice and easy. Most of our Walk In Enclosures come with an easy clean solution that makes it harder for dirt and grit to cling on to the glass. It’s perfect for those of you in hard water areas! When cleaning the enclosure it is best to only use warm soapy water on it. 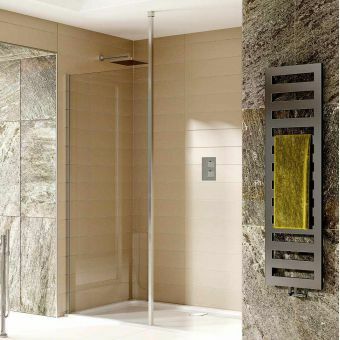 Anything stronger and abrasive can damage the Walk In shower profiles. Are walk in showers cold? 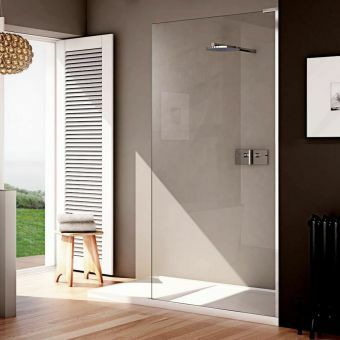 With the right heating your bathroom should never be cold, why not check out our radiators and underfloor heating. If you want to make sure you are warm and covered in the shower you can get a bigger shower head to do this. Why not look at the large Hansgrohe shower heads, as a showering experience we are confident they are the best in the industry. Are walk in showers any good? We can safely say they are and there are a few people in the office that have them. But everyone is different, so if you are not sure if a Walk In shower is the best fit for you then why not give our sales team a call?